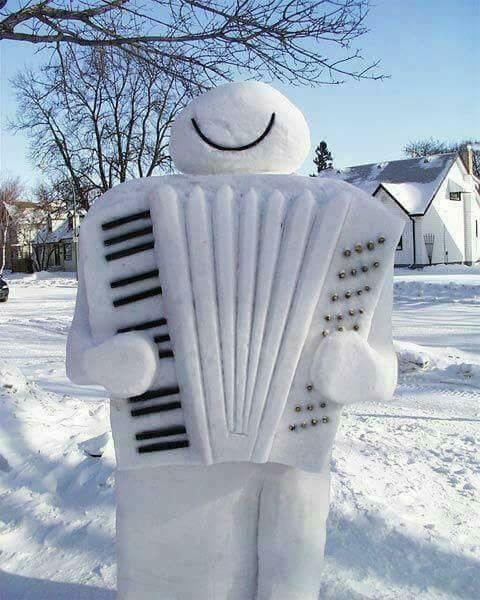 Coming from a mixed Polish & German heritage, I grew up being exposed to a lot of accordion music, and even took lessons for a time, as a kid. I still retain a fondness for the instrument, and even strap one on, now and again, and stumble through a few melodies. Invented in 1829, in Vienna, the accordion has spread worldwide, finding its way into the musical culture of many different countries. 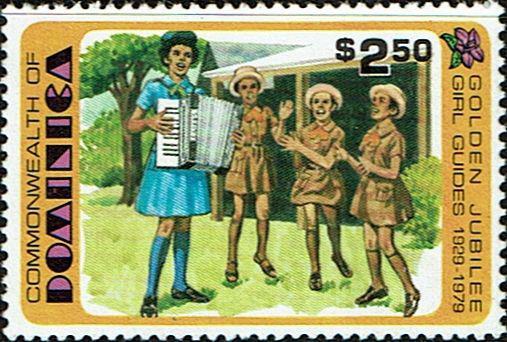 The Portuguese introduced the accordion to their colony of Cabo Verde, in an attempt to spread Western music styles to that land. 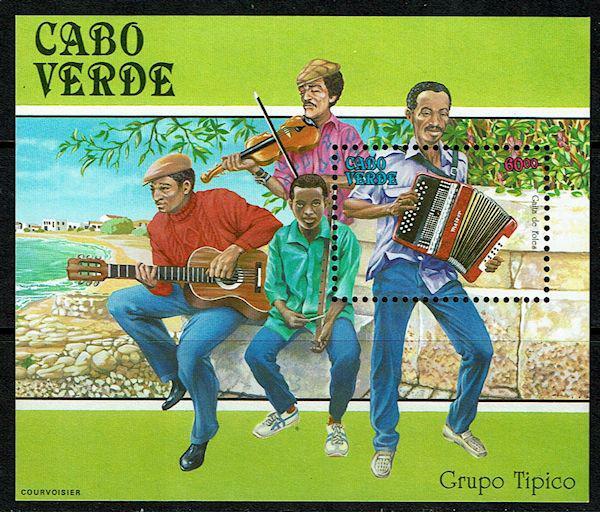 Instead, Cabo Verdeans developed their own musical genre, called Funaná, marked by an up-tempo repititious accordion melody, accompanied by a metallic rhythm scraped out on a ferrinho (shown, in the sheet, being played by the gree-shirted lad). 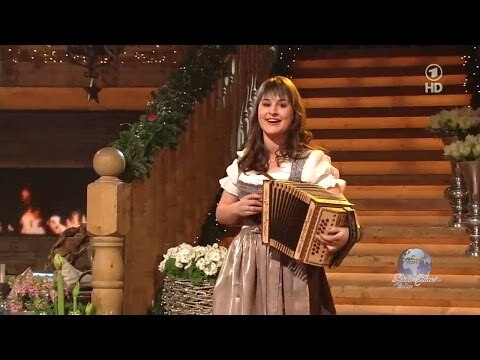 The Schwyzerörgeli is the Swiss version of the accordion, named after the town from which it originated, Schwyz. Like the Cabo instrument shown previously, this is a diatonic accordion, with each key, or button, on the right hand producing 2 different notes - one when you pull on the bellows, and another when you push. The Schwyzerörgeli is tuned differeneetly from the usual diatonic tuning, and the bass keys are spaced by a musical interval of a 4th, instead of the usual 5th. There are design differences in the reeds, also, all which go into making the Schwyzerörgeli not simply cosmetically different from other accordions, but which set it discretely apart. 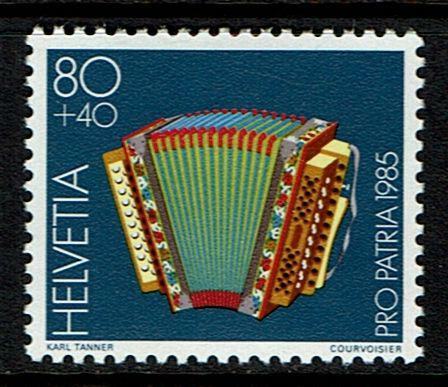 The Swiss accordion is used almost exclusively in that country. 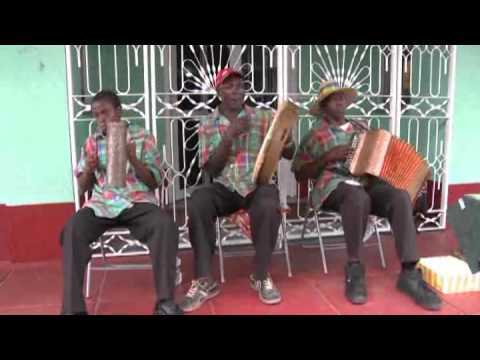 While not introduced to the traditional Dominican jing ping band until the 1940s, the accordion is now the most popular instrument utilized in that folk music, with the ensemble often referred to as an accordion band. 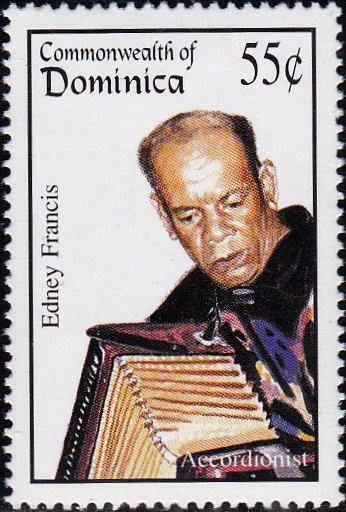 Edney Francis is one of the nation's most notable accordion players, and was honored on a stamp in 1994. 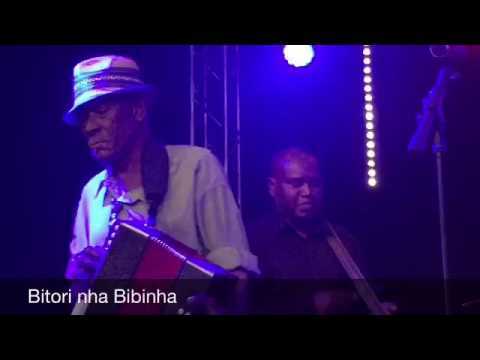 In this video, notice the similar use of a metallic scraped rhythm instrument, like the ferrinho from Cabo Verde. This one, though, is a cylindrical "gwaj" with holes pierced in it, and scraped with a wire brush -- sort of like playing a giant nutmeg grater. 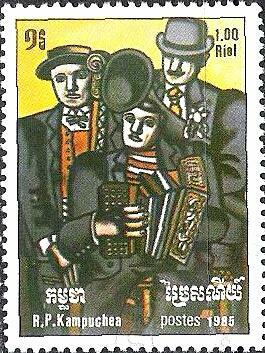 The accordion was a relative latecomer to Bulgarian folk music, insinuating itself into the scene in 1878. 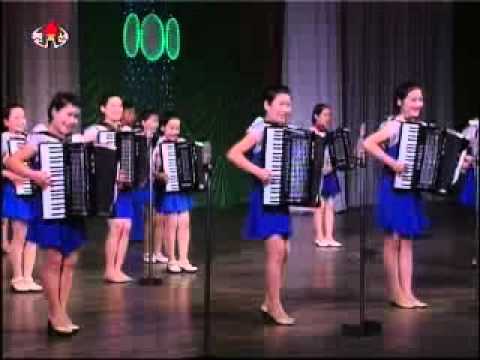 In fact, there are some who, because of its johnny-come-lately status, do not consider the accordion as part of the Bulgarian folk tradition. Nevertheless, it is now firmly entrenched in the culture, and Bulgaria has produced some legendary virtuoso performers. 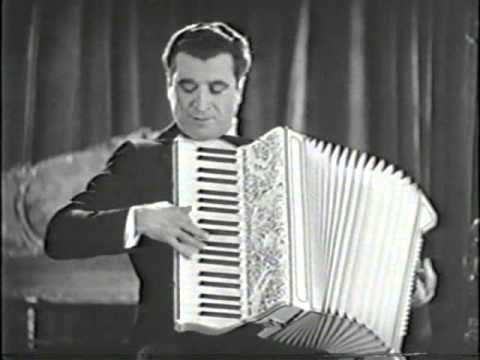 Bulgarian accordion music is marked by unusual time signatures and complex rhythms in frenetic tempos requiring fiery fingerwork, as shown by this Bulgarian accordion legend Traicho Sinapov. 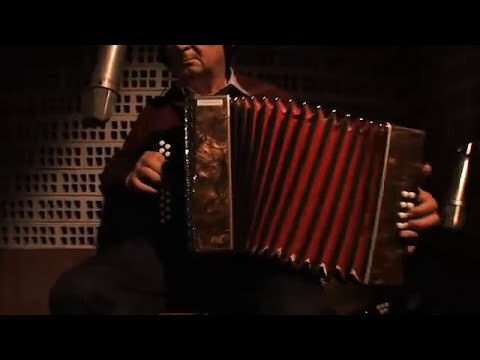 The accordion has been a mainstay of Uruguayan music since the great European migration of the 1800s. 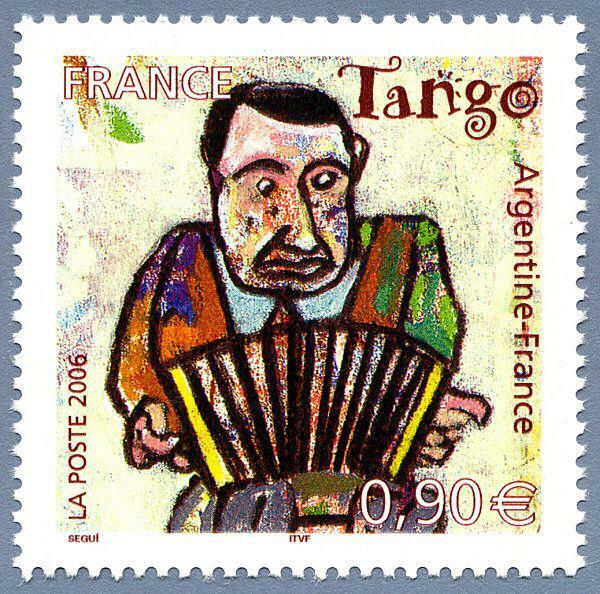 One type of accordion, the bandoneon, is the traditional instrument used to play the tango, while in the rural northern regions, the 2-row button accordion, with guitar accompaniment, is the instrument of choice. While reviewing what I've posted earlier, I noticed an instance (in the Switzerland writeup) where I suffered a brain cramp and used the term diatonic to refer to an accordion that plays different tones when pushing and pulling. The correct term is, "bisonoric." The author regrets this alternative fact. I'll zip through a few countries, here, today, starting with . . . 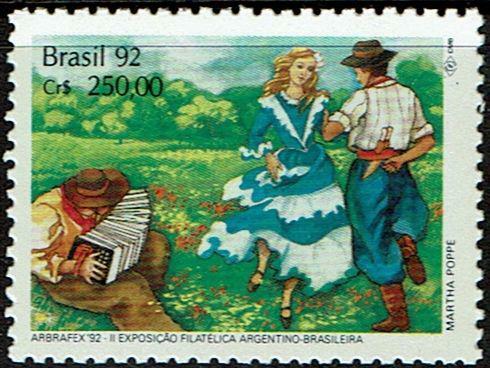 The story of the accordion in Brazil basically parallels that of Uruguay, with the instrument being introduced by the Portuguese and European immigrants. There is scant information to be found on the internet about the history of the accordion in Sweden, other than that it, too, was quickly and enthusiastically incorporated into the folk culture, with the chromatic button accordion as the instrument of choice. "The school day started at 8am. Mi-ran put on her perkiest smile to greet the children as they filed into the classroom. As soon as she got them into their assigned seats, she brought out her accordion. 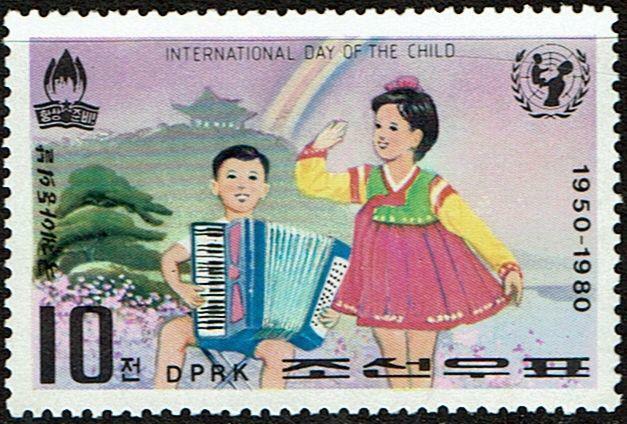 All teachers were required to play the accordion – it was often called the 'people's instrument' since it was portable enough to carry along on a day of voluntary hard labour in the fields." A performance of the 50th national schoolchildren's art festival took place at the Mangyongdae Schoolchildren's Palace . 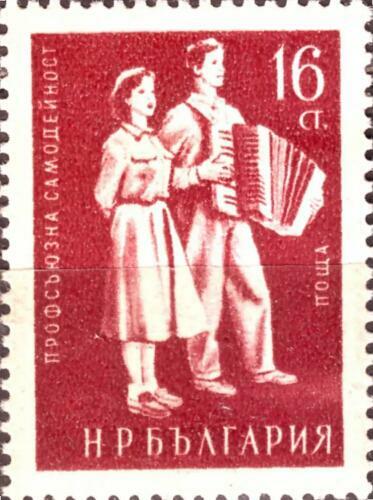 The accordion came to Russia via Germany, soon after its invention, and, in the 1830s, the Russians began manufacturing their own instruments, called the garmonika, or garmon, for short (remember the G in the westernized spelling represents the hard gutteral Russian H sound). This, too, was a diatonic button box (meaning the keys for the right hand played the notes of a specific scale) and was bisonoric (1 key played 2 different tones when pushing or pulling the bellows). Over the ensuing years, different variations of the garmon were developed in different regions, such as chromatic button types (which utilizes all 12 tones of the chromatic scale rather than just the 7 of the diatonic, and requiring a higher skill level to play), and piano keyboards. 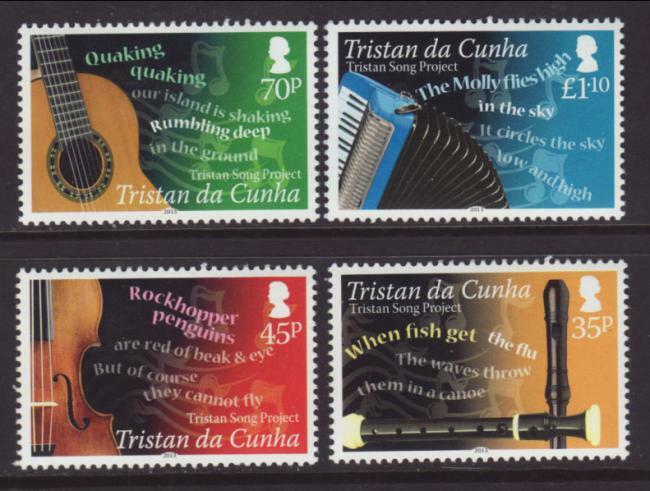 I never thought about accordions on stamps before! Very interesting article. 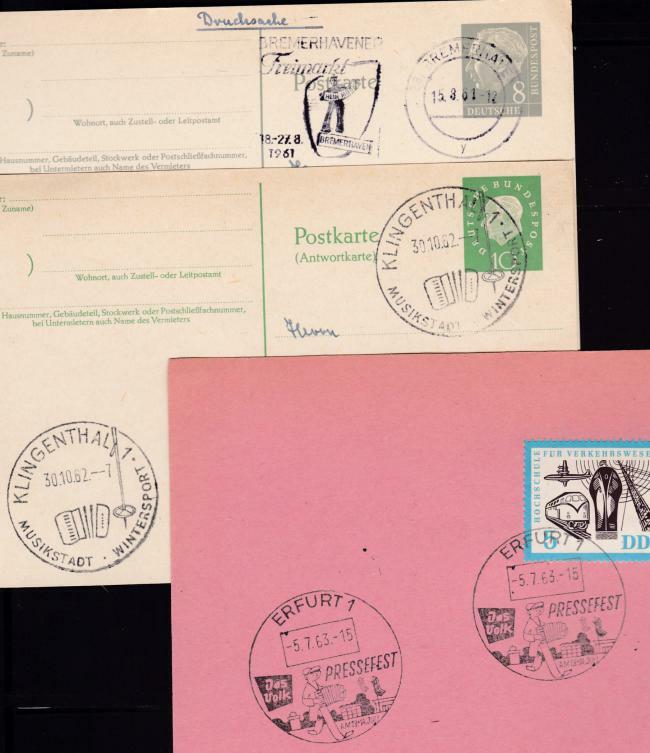 Thanks for the pictures of the stamps. I used to play the accordion a little bit when I was a boy. I wonder if you know about this one, Czechoslovakia Sc. #2681 from 1987. 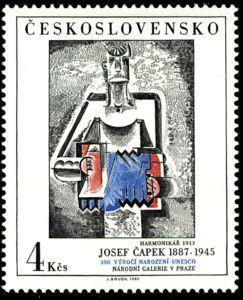 It's a reproduction of a painting by Josef Čapek (1887–1945), "The Accordionist", of 1913. I just came across it today. No, I didn't know of it, but it's going on my want list. Illustrated or 'Fancy' Cancels can 'Spice-Up' most any Topical Collection. My Sincere apologies.. The Scans do not Upload first time..
How cool! 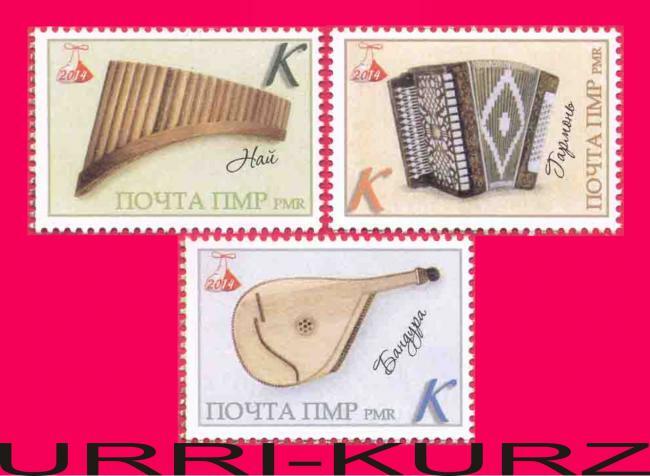 Never thought there would be postmarks with accordions! 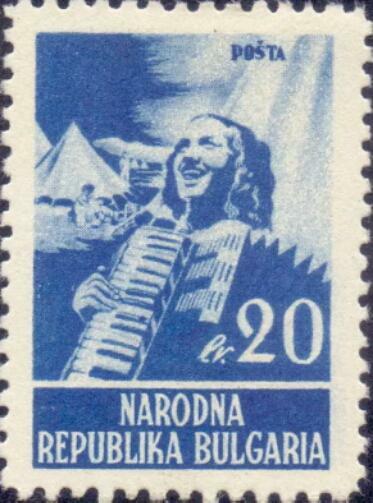 Here's the latest addition to my accordion topical collection, received in the mail today. This is Italy, Scott #1791, part of a series on Italian Industry. 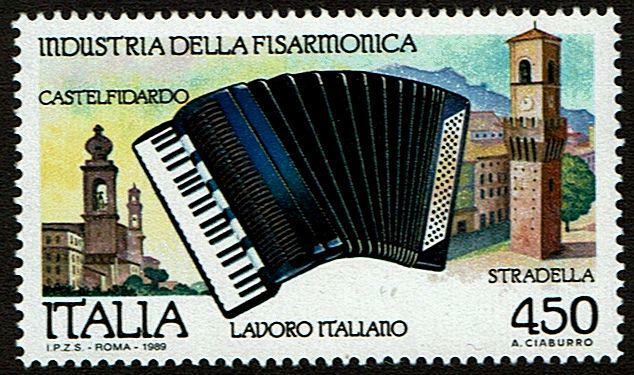 Castelfidardo is the accordion building capitol of the world, while Stradella, which once was an important center of accordion manufacturing, now houses a museum dedicated to the instrument. The video shows a performance by Count Guido Deiro, the man responsible (to blame?) 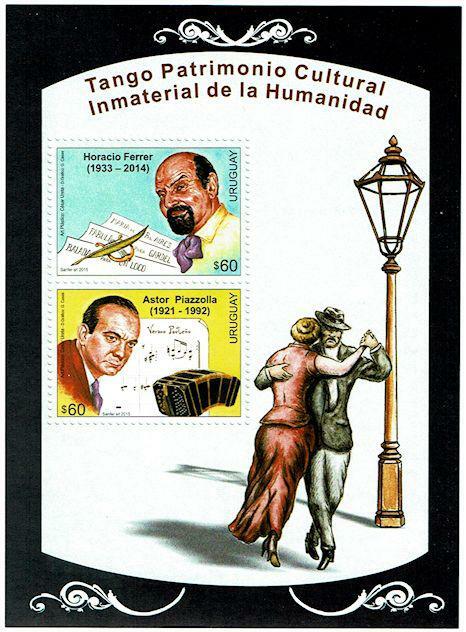 for introducing and popularizing the piano accordion in America. He is also known for marrying a teenaged Mae West, and performing with her on the vaudeville circuit for 4 years. What a fascinating and very well-done online exhibit, Ted! Outstanding! Found another one. Cambodia 606. "I cannot tell you how or why I survived; I do not know myself." So begins the book Music Through the Dark, the remarkable story of how Cambodian musician Daran Kravanh survived the "killing fields" and genocide under the Khmer Rouge regime. 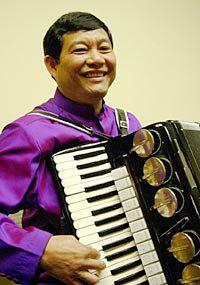 Kravanh came from a musical family of 11, but at 21, his tranquil life as an accordion player ended as the Khmer Rouge stormed the capital on April 19, 1975. Followers of Pol Pot singled out anyone educated, professional or "capitalist," meaning Westernized. Kravanh, then a college student wearing a collared shirt and tie, was singled out and marched into the forest with others to be executed. He escaped and tried to reach Thailand, but chose not to risk the minefields along the border. He surrendered to the Khmer Rouge and was put to work in the camps, farming without tools. 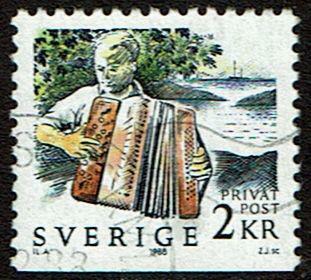 Then, a miracle: He discovered an accordion on a tree stump and began to play. 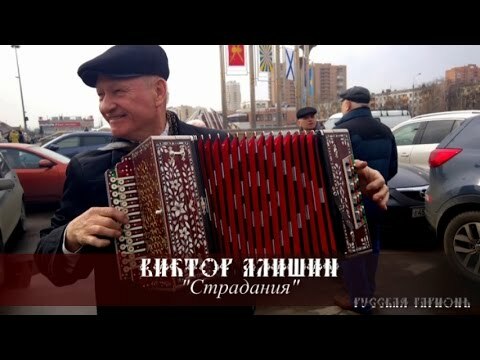 The soldier who owned the accordion told him to keep playing, and soon he and other musicians were performing in festivals glorifying the new regime. I haven't seen that set before, but it's a nice looking one, and will go on my search list. Wow! 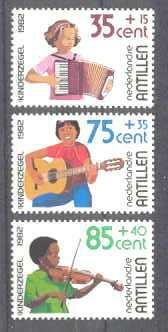 That is a nice looking set of stamps! Good. to see you again, Doug. Yes, I've got the NA set, but not the other. Thank you!! Especially for Count Guido Deiro--which led me on a ramble to rattletrapmuck and a contemporary player! I can't find anything about rattletrapmuck. 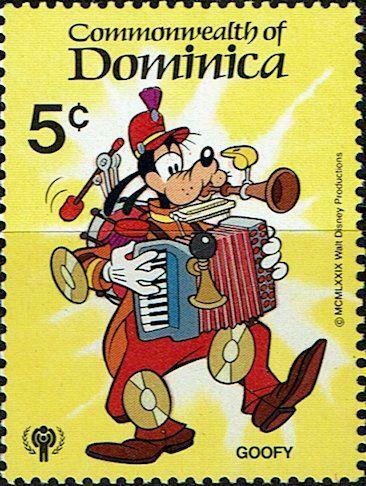 According to Wikipedia, on May 23, 1829, "Accordion patent granted to Cyrill Demian in Vienna, Austrian Empire." A bit off topic, but somebody posted this on FB today.